January 30, 2019, 1:34 PM · A reader wrote me to express her feelings of confusion - and even distress - over being placed in the second violins in her community orchestra. She was told by the director that she was a "good strong second violinist." But that made her suspicious. Was that just sugar-coating, because they think she isn't good enough to play in the first violins? Looks like they put some teenagers in the first violinists, but they were not necessarily more advanced than her. Would they ever let her play in the firsts? What was really going on here? I certainly recognized her feelings. They are complicated by a deeply ingrained mentality that many of us acquire, whether we want to or not, through years of a schooling system that emphasizes competition and hierarchy. It goes something this: the first violins are superior to the second violins. The seating is built on a competitive ranking system, and everyone is placed in order of ability, as the instructor or conductor views it. The best player is in the front, the worst player is in the back. The instructor may get this right, maybe not. People spend a lot of time looking around, assessing: is the person next to me better, or worse, and by how much? People challenge each other for chairs - to be promoted in this system. People question, "Does he or she deserve to be sitting there?" "Do I deserve to be sitting here?" She grew up with this mentality. I grew up with this mentality. A lot of us grew up with this mentality, and I'd argue that it's downright toxic to our music-making, our relationships and our ability to built a healthy orchestra community. "Is this the way it works in a professional orchestra?" she asked me in her e-mail. She had read a few forums and had begun to think about the idea that every instrument is equally important, and that the second violins actually have an important role in the orchestra. Let me tell you about my own experience. Growing up, I saw this from a lot of angles. I had the opportunity to be concertmaster of my school orchestra, and several youth orchestras, and I played in both sections in my city's more advanced youth orchestra. And then, during my senior year of high school, when I should have been "best," I got placed in the second violin section for All-State Orchestra. What? I was so embarrassed that I almost didn't want to go. On the plus side, we were playing Stravinsky's "Firebird" (I'd never played this piece at the time, and I adored it) and I'd have a weekend away with all my friends. Yet -- I'd have to tell everyone I was in the second violins. What could be more humiliating? It wasn't even that I didn't want to play the second violin part, it was the humiliation of it all! No worries, I went. But what about that attitude? It was completely ridiculous! What an honor, to be among all those talented young people, playing great works of music. Every person invited to be in that orchestra was an excellent player, first chair to last. And the second violin part for Firebird -- plenty of challenge right there. Why on earth was I so ashamed? It's actually not surprising, considering how steeped I was in this environment that held "ranking" in such high regard. As an adult, I've played in many professional orchestras, and mostly in the second violin section. I realized very quickly that there is an art to being a "good, strong second violinist," and my attitude really changed. That's because in my first job, in the Omaha Symphony, I identified a number of second violinists around me who clearly took pride and professionalism in their approach to playing second violin. I grew very interested in all those things involved in being a strong second violinist: knowing my part well, being reliable for counting, knowing and adjusting to the changing roles as a support section then a soli section, attending to every marking on the page, and then just tuning in to everyone around me. By now, I absolutely love playing second violin, and I still look for ways to be better at it. Is it different in professional orchestras? Certainly the residue of that toxic upbringing can rear its ugly head on occasion in professional orchestras. But in the best orchestras, everyone takes personal responsibility and pride in doing their best, in the role they are playing. In the best orchestras, in the best performances, we are all one. Everyone is important. One perfectly placed "ding" on the triangle is every bit as important as the violins nailing down that entire first page of Don Juan. It's also less often the case that people are seated according to "ability level" in a professional orchestra section, mostly because of the way auditions fill certain chairs when a tenured musician leaves. Subs very often sit in the back, and I've certainly seen occasions where the person sitting "last chair" is a sub who is a hotshot straight out of Juilliard and can play rings around everyone! Some orchestras also rotate the seating, which in my view is a healthy idea. Of course, in any orchestra, and especially in student and community orchestras, there were be a variety of playing levels. But I would encourage "playing level" to be something to work with, rather than something to rank. To put this in perspective: My students are of varying playing levels, yet I would never say that the most advanced player is "best" and the beginner is "worst." That kind of thinking is absurd, and frankly, sometimes the beginner gives the better performance. The goal is to play your best, whatever your level. And the goal in the orchestra is to create a balanced, supportive environment where every person can play his or her best, and every section can function at maximum capacity. Are we going to play music, or are we going to play ego games? If we are going to play music, we violinists do need to change our attitudes. We need to play in the section and the role where we are needed, to practice our parts, to count every beat and every rest, and to play our hearts out. We can draw inspiration from strong players and encourage the players who need more help. I would love to banish the idea of "second violin" as something inferior and see an environment that puts an emphasis on excellence and camaraderie in every section. January 30, 2019 at 07:47 PM · In my opinion the educational mentality that ranks from front to back is toxic. It puts the players who need the most help and attention at the farthest point from the instructor and by themselves. My system puts the strongest players front and back (and sometimes strongest leaders are not synonymous with strongest players, for the front stand, as long as they can master the music well), and lands those who need help in the middle. They hear the correct playing all around them, have something strong to follow and support from behind, and are where I can see, hear and fix them. It also strengthens the overall sound of the group to have solid players in the back. January 30, 2019 at 07:56 PM · Excellent article. I would like to add that second violin in the group with which I play is always the harder part, and I'm the only one who is able to do it! And yet, when I tell people I'm playing second violin with the group, they virtually pat me on the head trying to make me feel better about it. January 30, 2019 at 08:35 PM · As a career second violinist, I think it is important that people recognize that in a professional orchestra, everyone is professional. One does not move "up" to the firsts or "down" to the seconds, one moves over (some of my colleagues will play in the opposite section on occasion depending on who is taking leave). Yes, the concertmaster outranks the principal second violin, but section players in both sections rank (and are paid) equally. One of the real irritants of how TMEA does seating for the Texas regional and all-state orchestras is that the violins are ranked (1 - 20) first violins, (21 - 40) second violins. This means that the principal second violin literally placed in the audition just behind the last chair first violin, which is ludicrous--principal second is an important titled chair. I have actually been asked, when someone finds out that I am the "first chair" second violin in the symphony here, if I have ever considered "trying to get into the firsts," to which I always reply that if I ever decide I want a pay cut and a demotion, I'll consider it. In my ideal world, there would be full rotation between the two violin sections with the exception of the titled players, which would maximize the strengths each section must develop. First violins keep their upper position chops up; second violins listen to what other sections are doing around them, and develop excellent rhythm. The best orchestral violinists can do it all. January 30, 2019 at 09:02 PM · Michael Pratt, our college orchestra conductor, got this right: he did group violinists by ability but he consistently shuffled people across sections. If you were a back-third player, you were likely to sit in the back third in the seconds on one concert and move over to firsts for the next. (The competition to get in was such that no one who couldn't theoretically play a challenging first violin part was admitted.) Likewise, the first desk of second violinists might be sitting in the second or third desk of firsts for a different concert. The concertmaster role was the only one that clearly pegged to virtuosic ability, and pretty much everyone who played concertmaster in my era had actually attained conservatory-level chops (e.g. gone to Curtis while still in high school). Michael also did something lovely: he seated graduating seniors as high as he dared for their final concert. So I got to play a small solo bit in Also Sprach Zarathustra for my last concert, which was awesome. Anyway, violin is a journey, not a destination. Stack ranking violinists a la All-State and encouraging people to try to quantify their ability just feels really counter productive, especially from a pedagogical perspective but also musically. January 30, 2019 at 09:47 PM · In non-audition community orchestras, I see that second-violinists are typically those who are a little less comfortable playing in higher positions. Aside from that, the skill levels are not really so different. What Mary Ellen says about the Texas system is, in my view, a main driver of the problem. I suspect what she sees there is pervasive in many places. January 30, 2019 at 09:53 PM · This type of hierarchical rating can be so damaging, leaving psychological scars in young musicians that last a lifetime. We live in a "comparing" culture, and whether in orchestra (or any other facet of life) we begin to identify our "rank" as equivalent to our value as human beings. Being branded as "less than" by a low seating rank in my local community orchestra has little factual bearing upon my ability, except in the eyes of my colleagues. It has caused me to divorce myself from several local groups, though I'm arguably one of the most capable and experienced musicians. I don't want to be in these settings, because it brings back painful emotions of my musical youth. And because being seated among hobby players who rarely practice or prepare is annoying and actually damaging to my own playing. In the end, all of this comparing has little to do with being an artist, at best it is a distraction from devotion to the craft and art of playing the violin. In a way it can be good news: it has taken me out of all of the contemporary half baked, poorly rehearsed world of orchestra concerts and brought me back to solo and chamber works. And so I've grown greatly in the process. There is life after orchestra. My message to people who run orchestras, whether youth, community or professional: think less about rating your people and more about how you can help them grow in their skills and artistic process. Program works that are a realistic challenge for the people in front of you, instead of stoking your ego with Mahler and Strauss at every turn. And treat your people with dignity and respect; know who they are as people, not just as "Violin 2, #5." January 30, 2019 at 10:41 PM · Ah, human hierarchy at work. We find it all over from the schoolyard to the college to the workplace everyone is about rank and importance. Sad that something that should be fun becomes just another exercise in ranking. I'm one of the late-starters (back when I was 30). A little over a year into lessons my teacher invited me to join the Abbey Orchestra which was, at the time, composed of students of various teachers in the area. I was, of course, seated in the back of the second violin section and can still remember that first rehearsal - Schubert's Unfinished and I can remember getting about one measure in 10 that night. I did get better but decided to reject the offers to "move-up" because I got a new stand partner (usually decades younger) each season and I had fun showing them the ropes so to speak and it was fun to see them move up and over to the first chairs. Perhaps that is where I learned my abilities to teach and motivate. I no longer perform due to a few maladies that can stop my playing dead in it's tracks. If I could I'd still sit in the back of the seconds - I like it back there. Working with the youth orchestra I see my share of tears when a young musician doesn't achieve what she expected or the rage of parents when their young musician doesn't "move-up" according to their plans. Kind of sad but that is the way humans are wired - generally. January 30, 2019 at 11:33 PM · I avoided this altogether by switching to viola when I was still a beginner. But I've noticed that practices differ in the community orchestras I've played in. The more casual community orchestras are more likely to use ranked seating, with firsts mostly stronger than seconds, probably because there is a much wider spread of ability levels -- but even then, it's been fairly common for the principal 2nd violinist to be the second or third best violinist in the orchestra. Both of my recent all-amateur community orchestras seat their top four violinists across the front row of the 1st and 2nd violin sections, then ranked hierarchically down the 1sts and 2nds after that. I think I would prefer the first commenter's system that puts strong players in the back. In both of the high-level community orchestras I've played in, violin seating is rotational to some degree, including shuffling between 1st and 2nd violin sections. In my current elite/semi-pro community orchestra, as far as I can tell, the first three stands of 1st violins and first two stands of 2nd violins stay in their sections (these are probably the ten strongest players) and everyone else seems to go back and forth between sections. In the orchestra I subbed in earlier this month, violin seating is fully rotational outside of titled chairs. In both orchestras, all violinists are capable of playing standard repertoire 1st violin parts. January 31, 2019 at 12:30 AM · I thoroughly agree with the above. I play in the seconds in two orchestras (one being one of the best chamber orchestras in the region), and in the firsts in two symphony orchestras. I enjoy both positions equally and it has taught me that playing in firsts and in seconds are two different and, importantly, complementary skills. As a side note I should perhaps mention that some community orchestras with - shall we say - a broad spectrum of abilities, are grateful (or should be!) for the stability and help that a strong second string section brings to the ensemble. And where do the 3rd violins fit in? I've just returned from a rehearsal of Brandenburg 3 with my chamber orchestra. I, from the seconds, and someone from the firsts were deputed to play 3rd violin in this piece. It was a new and enjoyable experience - sometimes you're doubling the 1sts or the 2nds, and at other times playing something quite different which miraculously, thanks to JSB, fits in with everything else. January 31, 2019 at 01:01 AM · My daughter has already intuited this -- she was devastated when she was placed Principal Second violin, because she wasn't in the firsts. She has a ton of solos and it will be really good for her. Hopefully she will learn that! I love how my son's program runs orchestra. The kids rotate on every single piece. You will play first chair and you will play last chair. And every chair in between over the course of the year. They tend to place the younger students in the seconds and the older students in the firsts, but sometimes the younger ones can outplay the older ones, so it is more of a seniority thing than necessarily an ability thing. January 31, 2019 at 01:26 AM · Susan, please tell your daughter that in a professional orchestra, the Principal Second Violin is paid more than any of the other violinists with the exception of the concertmaster and associate concertmaster, and the possible exception of any assistant concertmasters. The divide in a professional orchestra is not between firsts and seconds; it is between titled players (including the Principal Second) and section players. January 31, 2019 at 01:35 AM · In the most challenging chamber music repertoire (late Beethoven, Brahms, Debussy) 2nd can be technically harder than 1st - and quite often the 2nd has a harder task musically because it's performing several tasks at once -- it's the glue and the putty of the quartet -- filling harmony here, keeping time here, counter-melody here -- and sometimes combinations of things in the same passage. Composers use 2nds for 50 different roles, which alone is reason why everybody playing string quartets should want to play 2nd as well as 1st. 2nd is a great place to be for a thinking musician. It's often been said that what distinguishes a great quartet from a very good one are the middle voices. Arnold Steinhardt and David Soyer are gods of course, but what really made the Guarneri Quartet unique in all the world-- and for quite a few years -- were John Dalley and Michael Tree. Now, let's be honest, in amateur orchestras, some people aren't cut out to play 1st simply because they're not as secure in higher positions. Some people -- this can be age-related but isn't always -- have trouble hearing high notes playing in a section so they have trouble playing in tune and blending with their section. If they don't self-select themselves to the 2nd violin section, sometimes conductors need to make that decision for them. But if your left hand is solid and comfortable high on the E string, and you don't mind being more exposed, 1st violin parts can be no more difficult than 2nd parts, and sometimes can be a little easier because you're playing more melody. January 31, 2019 at 02:09 AM · Second Violin is like Alto in a choir. We don't look down on altos. January 31, 2019 at 02:29 AM · Thank you, Laurie, for writing this. And thank you, her readers, for sharing your experience and insight. I played violin in High School (1st violin) under the system of ranking, and challenging to move up. After a break of 40+ years, I took up violin again and was pleasantly surprised how much came back to me! I now play 2nd violin in a community orchestra, and although the music is challenging, I put in ALOT of practice and by the concert date I do a good job. The 1st and 2nd violins both play in the higher positions. It seems like the major difference is that the 1st violins play more melody, some of it very fast. Some can handle the speed, others struggle. I try just to focus on my own playing, and not to compare myself to others. I just strive to continue to improve my playing, and to learn new techniques. All the good players around me (on all instruments) inspire me to be a good team member. I LOVE the idea of moving people around for each concert (except perhaps for the principals). January 31, 2019 at 03:04 AM · My high school teacher was also my private violin teacher. I was always accustomed to sitting in first or second chair. He asked me to chair the second violins, telling me he thought the job belonged to one of the two best players in the violin section. My "friend" and I always competed for first chair. Her entire life revolved around always being first chair, mine did not. I was a music major at university, so yes, I took my playing just as seriously as she did. I took the job as the head of the section and never looked back. What a pleasure it was to learn / relearn repertoire from that perspective. Now as a player in community orchestras, I always ask to sit in the second violin section. January 31, 2019 at 04:33 AM · I hate playing second violin- it's very much harder than first, IMO. Give me back of the firsts any day of the week. 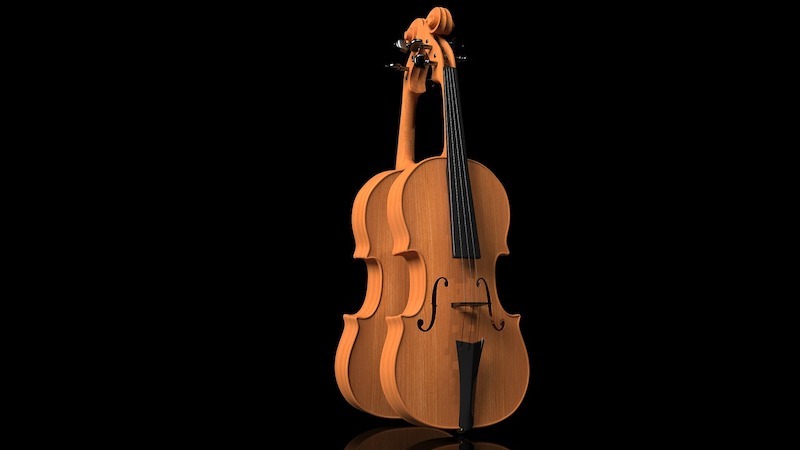 January 31, 2019 at 05:52 AM · The first violins are high note specialists. They win and keep their jobs on the second half of the E-string. 2nd Violins and Violas are the support crew, like the interior linemen of a football team. Their parts are frequently busier and awkward. In a lot of 19th century symphonies the seconds double the melody an octave lower. They need to play that main line louder and more expressive than the firsts. After choosing the principal 2nd, one of the strongest violins in the orchestra, seating should not matter. What some choirs do is put the stronger singers in the back row, singing over, leading the weaker voices. January 31, 2019 at 05:57 AM · No one has mentioned what to do if you are in the back of the section and there are empty chairs in front. I am a second violin phobe: my preference is first, viola, second. When it comes to history I have played all three about equally. January 31, 2019 at 06:18 AM · I have played both and clearly each has its challenges. In non-professional orchestras, the average first violinist is a stronger player than the average second violinist, there is no getting around it. The current arrangement motivates kids to practice to “move up”, and that is certainly positive. January 31, 2019 at 10:04 AM · I wonder if such mentality exists in other sections (ie flute, French horn, tuba, etc) where there are much less people. Because some of those sections are so small, it is an achievement to just get a spot, regardless on first or second. Or we as human being just having compare regardless on where and when. January 31, 2019 at 12:32 PM · Every orchestra is a complex social organism made up of a wide range of personalities. In order to tolerate and survive the petty disagreements, resentments and humiliations that occur (not least for the poor bloody seconds) you need to develop some pretty nifty social skills, not to say a thick hide. Some of us eventually get weary of it and resort to chamber music with carefully sifted friends who never pull rank or make blunt remarks! January 31, 2019 at 12:46 PM · "I wonder if such mentality exists in other sections (ie flute, French horn, tuba, etc)." As a teenager I played in a community orchestra where my violin teacher was concertmaster. There was a ruckus one day between the tuba player and the orchestra manager who was also Principal Second. None of the players were paid, but apparently the tuba player learned that a few of the principals among the winds were being paid a trivial fee just so that there would be at least one decent player in each of those sections. The tuba player tried to argue that he, as principal, should get the same fee. Having lost that argument, he took his tuba and left. One of his friends, a cellist a few years older than I, followed him into the hallway and convinced him to stop being a [jerk], and he came back. Later the cellist explained to my brother (also a cellist) and me that the manager had offered to place an asterisk next to the tuba player's name (as was customary for all the principals) and that this was apparently reward enough. Note that in the above description, the word "jerk" was inserted because the original word I placed there caused my comment to be auto-filtered by the site. Very cool feature, Laurie! Perfect for [jerks] like me. LOL!! I play viola in two small string orchestras. Invariably the other violist (there are never more than two) is a younger, less experienced person, so I always defer and allow them to be Principal. My ulterior motive is that I can see better from the other chair and my viola projects more toward the audience. January 31, 2019 at 02:28 PM · More thoughts and memories … I'm sure that historically speaking, the "toxic inferiority complex" syndrome dates back to school orchestras, as Laurie suggested. I remember my first venture into orchestral playing at school when in the junior orchestra the distinction between firsts and seconds was obvious - the firsts were those who could get out of the first position (3rd posn if lucky). This extended to the senior orchestra, but to a lesser extent - the firsts were those who could get to the 5th position and above. Being a cellist at the time, I was fortunately immune to all this, so had no hang-ups when I moved over to the violin much later in life. I remember at school we performed an orchestral piece by Vaughan Williams (I don't recollect its name - a concerto grosso perhaps?) which was specifically composed to cater for the full range of technical abilities in a school orchestra, including those who preferred to play only on open strings! January 31, 2019 at 03:34 PM · If you ordered a cheese and tomato sandwich and were served just 2 slices of bread, what would you think? The seconds and violas are the indispensible middle ingredients between the top line and the bass clef! January 31, 2019 at 03:49 PM · I wish someone had had this conversation with my teachers when I played violin in middle-high school. Our orchestra seating was hierarchy-based, so the better players were seated higher up in the first violins. After that, I made it my mission to get to first stand of first violins. I succeeded, but at quite the cost to my self-esteem and self-confidence. January 31, 2019 at 07:42 PM · Continued - I don't know if any orchestra does this; The principal second and the assistant concertmaster, at the same pay scale, could alternate/rotate each concert set. January 31, 2019 at 08:22 PM · I happen to believe people should be paid by the number of notes they play. January 31, 2019 at 08:30 PM · "I wonder if such mentality exists in other sections (ie flute, French horn, tuba, etc)." Funny you mention those instruments -- the two biggest instances of seating drama I've seen in orchestras, the only two that have resulted in people quitting orchestras, have been in the flute and horn sections rather than the strings. Normally, I would guess that disputes might be limited by people playing specific roles, e.g. last flute doubling on piccolo, or high and low horns. But it seems common (at least in community orchestras that play professional rep) for principal wind and brass players to either sit out or switch to a different part for at least one piece on each program to limit fatigue, and I think the seating drama happened in those pieces with people expecting to play the 1st flute and 1st horn parts for those pieces being passed over. February 2, 2019 at 12:10 AM · Thank you, Laurie, for bringing this to our attention. It is an important issue indeed, and one that is highly problematic. I find this attitude rather toxic, and I find it sad that more orchestras aren't rotating sections. In the music school orchestra I play in, seating is fixed and more or less based on ability. The principal 2nd violin is one of the best violinists in the group. The lower level orchestras rotate seating for different pieces, which is nice. A local youth orchestra has fixed seating, while another local youth orchestra has rotating seating. I think orchestra directors should mix people up more. I would even venture to say that players of both violin and viola should be given the opportunity to rotate between the violin and viola sections, as long as it's not for the same concert (except when there's an intermission) for logistical reasons. February 2, 2019 at 02:11 AM · I also grew up under that hierarchical seating system, and I think it contributed to my burning out on the violin and taking an extended break from it. I think that youth and school orchestras should do more rotating of players than they do. Where you sit makes a huge difference how the music sounds. When I was a teenager I found I really enjoyed the front of the 2nd violin section in the traditional inner voice seating, and then it happened to me a couple of times that after doing well there, I was asked to "move up" to the firsts. I recognized that this was intended as an honor even as I enjoyed my new seat in the back of the firsts much less. Even now when I'm sitting on the edge of the stage towards the back I feel like I'm in Siberia. I can't see the conductor very well, I can't hear much of anything except my own part, and it's easy for me to lose the beat and get lost. I loved playing in an orchestra, but it was there in the back of the firsts that I finally understood why some people complained about orchestra and even why some people quit. Then I switched to viola. It's always an inner voice and as a violist I'm always in the middle of things. I think the viola section has the best seat in the house for seeing and hearing and being in the heart of the music. Second violin seating is similar, in the traditional seating anyway. I have never played 2nd violin in the opposite-the-firsts configuration, and I wouldn't want to. February 2, 2019 at 04:19 AM · My orchestra and chamber music journey has been extremely weird because it started on viola and yet, I actually started on violin and play both these days. Since I'm a composer and harmony geek, I love listening to music as a collective unit and I enjoy hearing the interactions between parts. This is the main reason why I love being in the viola section, where I can hear everything clearly like Karen said above. I recently started playing first violin in orchestra and it is just as fun because I can play the melody and ride above everyone else. Unfortunately, I don't get to hear the middle voices as clearly as I used to back when I played viola in orchestra, but I enjoy the new experience. I plan to play more viola in orchestra in the future, as I love playing both. Unlike many people, I don't care what my role is in the orchestra. I just love being there and playing in a team. February 2, 2019 at 01:24 PM · This seems to stem from what appears to be the norm across the pond - competitive auditions. As people have said, in a professional orchestra, EVERYONE's important. In our quartet, I play 2nd violin. Orchestrally, I've always played first. It's probably temperament. I DID for a few weeks play principal 2nd, but decided it wasn't for me and went back into the 1sts. February 2, 2019 at 03:22 PM · Ella, when I made the transition from orchestral cellist to orchestral violinist some years ago the first thing I noticed was the completely different sound when playing in the seconds. When I was in the cello section I was largely unaware of the detail of what was going on the violins, the seconds in particular - violas were more accessible because they were next door to us. In the seconds I am more or less directly opposite the conductor and hear what he hears in the orchestra, a very good learning experience. That is why I would advocate a violinist's first experience in an orchestra as being in the seconds. February 2, 2019 at 04:41 PM · I am Principal second in an excellent professional orchestra. Nevertheless, is far from uncommon for a member of the audience to ask if I hope one day to be good enough to play first violin. And I don't think this attitude is confined to non-musicians. There is subtle lack of respect that comes from all sides. Happily, in my orchestra we are moving to a simple "violin" designation, and all section players will rotate between first and second. February 2, 2019 at 05:22 PM · Thanks, Trevor, for sharing this. I’d love to play second violin one day. Maybe some time... it’s just the way things turned out. February 3, 2019 at 06:45 PM · Maybe the title here is all wrong and what we ought to fight is the "toxic superiority complex" of first violins. If you read books about the art of quartet playing they (almost?) all make the point that one can not play first AND second violin, you have to choose. I have played quite a bit of chamber music and I believe strongly that this is BS. Probably invented by people who don't want to play second. On the other hand though it is true that second violin parts (and second flute, oboe etc. parts) are generally technically less demanding than first parts--while it is also true that all professional second violinists would have no problem with first parts technically. But in amateur orchestras there is little choice but to place weaker players in second violin (in my experience they hardly ever seem to be bothered by that). There is music where the second part is at least as much fun as the first, for example Dvorak's American quartet.